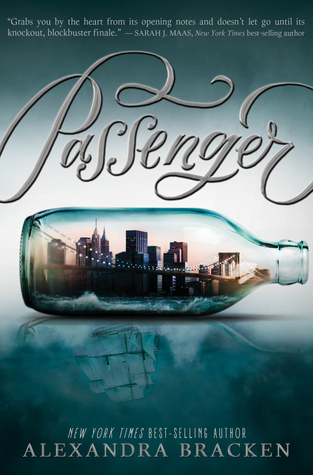 I picked up Passenger after many weeks of just staring at the beautiful cover. I normally get bogged down by longer books, so I was a little intimidated by the size of this novel as well as the mixed reviews I had been reading. I finally talked myself into picking it up when I went on a week long beach trip and I'm really glad that I did. It starts out a little slow with lots of characters to keep up with, but the speed builds about three chapters in. Bracken's writing style is so enchanting and immediately pulls you into the scenes. The book is written in two first-person perspectives, Etta and Nicholas. The reader follows the two main characters through a time-traveling adventure. I loved the constant change between time periods and location. It was fast paced and I was easily able to imagine the incredible destinations that the two characters visited. It is pretty common to become confused in time travel novels, but Bracken writes so clearly and eloquently that the reader has no difficulty keeping up. Without spilling too much about the synopsis, the author bravely tackled topics such as race, culture, and sexism. These topics were thrown around a good bit, but they were not too "in your face". It was obvious that Bracken had completed her fair share of research in order to make the times, places, and cultures appear as they should. Passenger was an all around thrilling novel, often leaving me unable to put it down. I would absolutely recommend this book to friends and I will be picking up the next installation as soon as it hits the shelves in August! Thanks for reading guys! Check out the giveaway tab for a fun giveaway that ends on Friday.